Spring is here…and that means free stuff. Plenty of talk about stuff these days. My cousin sent me this link on Earth Day. Rob Finch worked on a great story about old stuff a few weeks ago. As soon as this winter weather goes away, folks will be tossing items out of the garage, the basement, the backyard, the toybox or wherever and right out onto the curb. Last spring I heard this screeching and scraping coming down the street. Not a skateboard. Not a car riding on a flat. Not a locomotive. Nope. It’s a guy dragging a giant leather couch. People are awesome. I hope to stumble on a few more good ‘finds’ this spring. It’s certainly interesting. This entry was posted on Thursday, April 24th, 2008 at 12:32 pm. 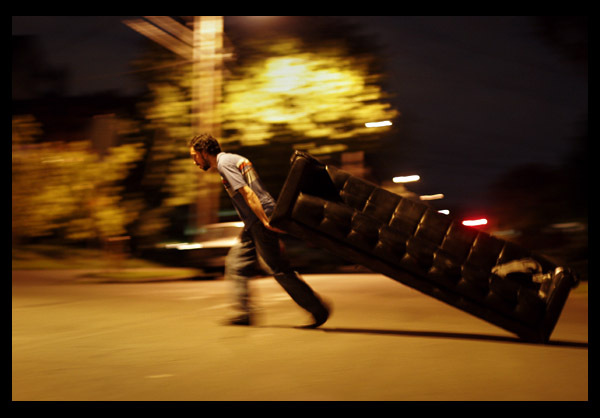 It is filed under found, neighborhood and tagged with couch, found, free, labarge, oregon, photographer, photojournalist, photos, portland, scape, tim. You can follow any responses to this entry through the RSS 2.0 feed.